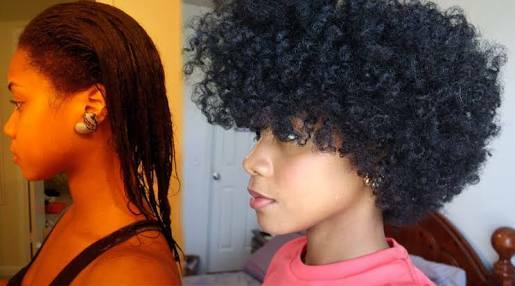 So many ladies and even guys now want to go natural, but they are stuck at whether or not they should cut their hair a.k.a start afresh or they should transition. If you've recently decided to make the move, then welcome aboard this voyage! Yes, you might get sea-sick...you might even want to jump ship! Trust me, the waters can get rough...and many nights you may not see the shore! *Okay enough of this metaphor already, this is haircare, not poetry. Back to the matter, CONGRATULATIONS on your decision!! Jumia Nigeria walks you through this boulevard and share tips about transitioning to natural hair. Keep Your Hair Moisturized: We know the pain of handling two textures - that's what prompts us to get fresh relaxers anyway! The only way to survive this two-textured phase, without hiding under a beanie or head scarf for six months is to moisturize. Make sure that you spritz your hair daily with some good quality diluted leave-in conditioner like the Shea Moisture, aloe vera juice, rose water and conditioner. Don't forget to deep condition your hair once a week. Choose Your Products Wisely But Don't Get Obsessed! : I've come to learn that products do not grow your hair, TLC does. I will recommend deep condition with a mixture of 2 tblspns mayo, 2 tblspns olive oil, 1/4 cup aloe vera juice and 1/2 cup good quality conditioner (eg. El-Glittas) once a week. Use Protective Styles! : Protective styles are hairstyles that protect your hair from damage caused by too much sun or rain and mechanical damage like combing a lot and manipulation. As a natural, protective styles are the secret to length retention and thickness. Low manipulation styles that favour both textures such as braid outs and twist outs are the best. These will better mask the different textures, and also ensure that you don't comb your hair incessantly.